Are you a teacher that's recently signed up to Grok? A massive Grok welcome to you! You're probably wondering where to start. Never fear! Here is our ultimate Guide to Grokking like a pro. Teacher verification is the very first thing you should do as a new Grok teacher! Verification gives you access to sign up students and manage student accounts at your school. You’ll also receive FREE access to all of our materials, including problem solutions and teacher notes! It's best if you add your full (legal) name and school email address to your account. This makes it easier for us to verify you. Follow the links below to find out more about Teacher Verification and how to request it. Once you've requested verification, it should only take a short time to process - keep an eye on your emails in case we need any extra information from you. Before you dive headfirst into teaching Grok, you'll want to familiarise yourself with our courses. You'll not only see the range of content we offer, you'll also try out our Learning Interface before your students do, so you can master it and show them how it's done. All our courses are shown on your Launchpad. This is where you start every time you log into Grok. When you click on a course, you'll see the course outline, and a red button to enter the course. Now you're in the Learning Interface! Most Grok courses have slides, containing notes and examples, and problems, where you need to write some code. As a verified Grok teacher, on each problem you'll have access to a Teachers Notes tab, which contains suggestion of how to help your students if they need help with this problem. The Solutions tab is usually only available after you've correctly solved a problem (this goes for your students too!). Don't forget to Run your code before you Mark it! 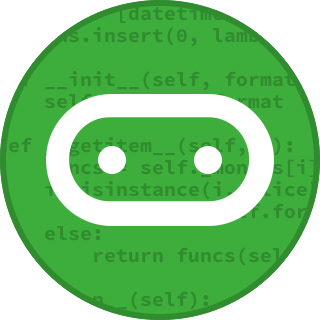 The Mark button is only available if you run your code after making changes, to encourage students to test their code themselves first. When you mark, our auto-marker will give you feedback about your program. Read this feedback carefully, as it gives you hints about what to do next! As for which courses to try out, here are our top 3 picks for new Grok teachers (plus a bonus for Aussie teachers). Or you can use the filters on the Launchpad to find a course that suits you! 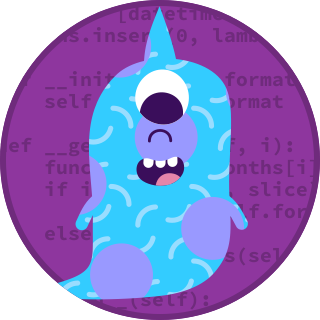 Create your own colourful critters with code! Use drag-and-drop blocks to write a program, learn about sequence and ordering, and create fun monster characters. If you or your students are completely new to programming, this is the course for you. You don't even need to write code, just drag and drop code blocks to make a code recipe ("algorithm") which tells the computer what to do. Plus the monsters are super cute (even if we do say so ourselves)! An introductory course using the programming language Python for people with no programming experience. 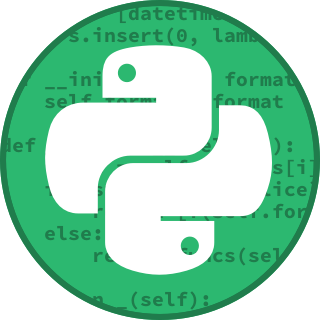 Python is our favourite general purpose programming language for students, because you can cover almost all areas of Digital Technologies with it, and it's easy to learn! This course covers the basics of writing code in Python. 💡Australian Computing Academy "DT Challenges"
If you're an Aussie teacher and your students are in grades 3 to 8, you're in luck! The Federal Government has funded heaps of resources from our partners at the Australian Computing Academy, and they're all free for your students to access. The DT Challenges are hosted on Grok with all our other courses - check them out here. We really like the DT Challenge Chatbot (in Python or Blockly) where you write code to create word games and develop a Pirate Chatbot. Arrr, me hearties! Now that you've seen the Learning Interface and had a go at some of our courses, it's time to get your students onboard! Registration is an easy process. Each student will need their own account, which is associated with their email address (just like yours). This means that students can use Grok inside the classroom and out, continuing their learning and keeping track of their own progress, wherever they go and for as long as they like. If you have your class list handy, you can register your students yourself by following our instructions in the links below. We have arrangements with certain education departments across Australia, so check our FAQs below first to see if you need to register your students - you might be surprised to find that they already have accounts! Depending on what courses you want your students to use, you might choose to register a free account, or a paid subscription for your students. Registering paid subscription accounts will generate an invoice for your school to pay. Some schools choose to fund this out of existing budget, and some choose to include Grok on their booklist for parents. It's up to you! Free accounts are designed to give your students a taste of Grok! 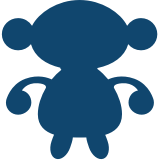 Your students will have full access to the Grok short activities, and trial access to the Grok courses, but no access to the Grok competitions. 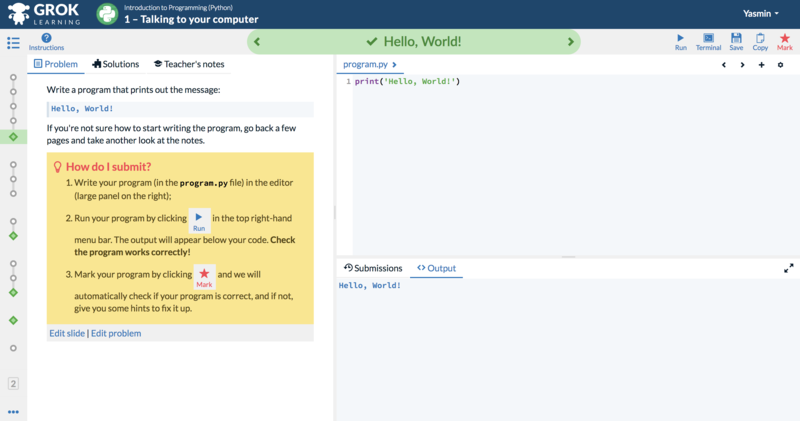 Our short activities are perfect for an hour of code, a code club activity, or for testing our platform in your classroom. Paid subscriptions are the all-access deal. Accounts with subscriptions have access to all Grok courses, competitions and short activities, plus all future content. You can see all our pricing information here. A paid subscription for an individual student lasts for 12 months from date of purchase (or you can get a whole school site licence). You can assign students to courses via your Teacher Dashboard. This is where you'll spend a lot of your time on Grok, as it's where you can administer your students, so let's dive in! You can get to your dashboard by clicking on "Teacher Dashboard" at the top of the page when you're logged in to Grok. On your Teacher Dashboard, you'll see a list of all students at your school. If you find that there's too many students, you can put them into groups! Most teachers make class groups or project groups, but you can organise your students however you like. The link below explains how to set up groups on your Dashboard. From the Dashboard, you can assign students to a particular Grok course, which means it will show up in their enrolment list. On the Launchpad, we put the latest assigned course right up the top under "Here's what you're working on", so students will see it straight away. If you assign multiple courses, students can see all their assigned courses under "Mine: Assigned". How do I assign a course to my students? Why can't I assign a course to a student? Keep in mind that students can only access courses that their account allows. For example, to access a DT Challenge (provided by the ACA), students must be in grade 3 to 8, or have a paid subscription. To access a Grok competition, students need a paid subscription. Now you've got your students assigned to courses and happily absorbed in this new world of coding. Gold star for you 🌟! The last and final step to complete Grok mastery is monitoring your students' progress in their courses. Again, you can do this from the Teacher Dashboard. From the Dashboard, select a group of students and then click "Assigned progress". You will see all the courses you have assigned to each student, and their progress as a series of coloured bars. You can filter by grade and group in this view, or use the search box to find a particular student. You can even click on the progress bars to see exactly what that student is working on! If you want to see student progress in just one course, you can! Choose a course from the "Course Progress" drop down menu. You can also download student marks for a specific course, by selecting students using the checkboxes and then clicking "Marks". You might use the exported results for assigning grades, writing reports, or discussing student progress with other teachers. For courses or competitions that offer certificates, you can download those too. What do the different colours mean on the course progress bars? How can I see my students' work? How can I download student marks? How do I download certificates for my students? This is the part where you shine! We've given you all the resources and tools you need to teach Digital Technologies like a pro. How you deliver that in your classroom is ultimately up to you. You can assign your students a course to work through at their own pace, go through worked examples in class, register students for competitions to challenge them against students around the world, and much more. We have many teachers doing awesome work using Grok Learning. You can follow our blog for more ideas on how to get the most out of Grok. We cover topics ranging from project ideas for the classroom, to why we think programming might be the most powerful skill you can learn, to unplugged cross-curricular content, and how to get more girls interested in coding. Our blog posts are for you - our teachers - to help you teach Digital Technologies to the change-makers of the future. Each month we'll email you a Teacher Update to keep you in the loop about all things Grok. This includes upcoming competitions, new courses, FAQs, blog posts, and much more. Make sure your communication preferences are up-to-date so you receive this email. At any time if you have questions or suggestions, you can email our fabulous team at support@groklearning.com and we'll get back to you asap with an answer! We want our wonderful teachers to get the most out of Grok Learning, so don't be shy in letting us know how we're doing. You can also follow what we're up to on Twitter (@groklearning) or Facebook.